Posted on Fri, Apr 6, 2012 : 2:01 p.m.
As work on the Norfolk Southern Railway is under way in Michigan, Amtrak riders can expect more changes in schedules, train cancellations and routes covered by motor coaches this month. Work on the Norfolk Southern Railway in Michigan is affecting schedule times for Wolverine line passengers. Poor track conditions prompted a slowdown order, announced March 15, that requires trains to slow to 25 to 30 mph. Amtrak can normally operate the trains at 79 mph. Work on the tracks will be completed April 16-19, and passengers on the Blue Water and Wolverine lines can expect normal travel times in Michigan by early May. The Wolverine line travels through Ann Arbor. 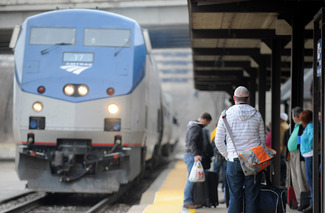 In the meantime, Amtrak service in mid-Michigan will continue to be delayed from 45 to 90 minutes on Pontiac-Detroit-Chicago Wolverine trains, with lesser delays to the Blue Water trains to and from Chicago and Port Huron. 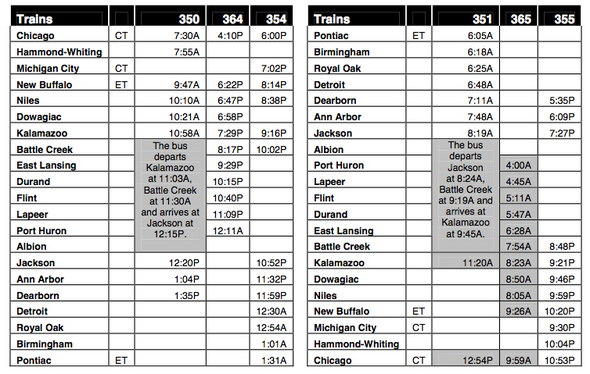 Train 350, the morning eastbound Wolverine from Chicago to Pontiac, will terminate at Kalamazoo. Passengers continuing east of Kalamazoo will be accommodated on a dedicated bus serving Battle Creek and Jackson, where passengers will reboard a train for the remainder of the trip to Dearborn and intermediate stations. Train 351, the morning westbound Wolverine from Pontiac, will terminate at Jackson. Passengers continuing west of Jackson will be provided with dedicated bus service to Battle Creek and Kalamazoo, where they will reboard a train for service to Chicago and intermediate stations. The Kalamazoo departure of the continuation of train 351 will be 90 minutes later, at 11:20 a.m., arriving in Chicago at 12:54 p.m. CT. The late morning Wolverine 353 from Pontiac to Chicago is canceled. The early afternoon Wolverine 352 from Chicago to Pontiac is also canceled. Wolverine trains 354 (Pontiac to Chicago) and Train 355 (Dearborn to Chicago) will continue to operate with delays until the track repairs are completed. Further significant temporary changes to accommodate track work after April 19 will be announced as details become available, Amtrak said. Check out the schedule below or visit Amtrak.com/alerts to see more service alerts. The highlighted sections of the schedule below indicate specific schedule changes April 16-19. Sun, Apr 8, 2012 : 3:21 p.m.
Based on previous articles, I believe this work on these privately-owned tracks is being funded by the taxpayers of the State of Michigan while the State and Norfolk Southern continue to try to negotiate a purchase agreement. It's like a home-buyer paying for a new sewer connection on a house he's just put an offer in on. Odd. Sun, Apr 8, 2012 : 5:41 p.m. Yes it's true. Nortfolk Southern has little interest in repairing the tracks; freight runs at lower speeds and can use lower-class tracks. Passenger rail requires higher-class tracks for higher speeds. Freight companies that own the tracks and dispatch trains do not have much incentive to take on capital investments sometimes. Sun, Apr 8, 2012 : 1:23 p.m.
We need to start somewhere on investing in improved public transportation. When gas hits $5, $6 and more/gal people will be clamoring for these types of transportation options. Leadership is about having long term vision and committing to these goals before we end up in a desparate situation and a stalled economy dependant upon intense fossil fuel use. Sat, Apr 7, 2012 : 2:46 a.m. Honestly does anyone even care what the train does? We are headed to Chicago for a week on Monday and my car will be doing 80 the whole way. Sat, Apr 7, 2012 : 3:15 a.m. Sat, Apr 7, 2012 : 2:18 a.m. Brutal, absolutely BRUTAL!!! The ride from A2 to Union Station that is. It was six hours and they ran out of everything including ice about a third of the way there. I refused to ride back to A2 on that rail so I caught a 45 min flight into DTW. I will NEVER take the train again - ever! Ride at your own risk, it's not fun. Sat, Apr 7, 2012 : 3:14 a.m. I dunno. It's far far cheaper. You get to sit in a nice big chair instead of squashed into a tiny one with at least two other people. You don't have to get body searched. You can get up and go to the bathroom whenever you want. Oh and you can bring you own food and water with you. And if you are really lucky you can get a car with electrical outlets. And you can sleep. Sat, Apr 7, 2012 : 1:45 a.m. Yes, our billion dollar highways never have orange barrels on them, either. I don't suppose lane closures and accident cleanups are included in the assumptions of the financial models? One of the great things about high speed trains is they are on a dedicated right of way and aren't as susceptible to the poor decision-making skills of thousands of humans behind their own rolling blocks of plastic and metal. Sat, Apr 7, 2012 : 3:45 p.m.
You can reroute fairly easily? You're never stuck for hours and hours on a highway? Are you for real? Are you Superman? Once Norfolk Southern lifts its slow orders and later the state buys this portion of the tracks from K-Zoo to Dearborn, the Michigan to Chicago line will be one of the fastest portions of the national network outside the Northeast Corridor. Already, the track speed was increased to 110 mph in the western portion of the state, along the tracks that Amtrak already owns. We won't see those speeds here for a long time, but consistent speeds of 79 mph are achievable. It's not like everybody is going to take the train. But you need multiple modes of transportation and ridership is growing. And every form of transportation is subsidized. Highways are paid by gas taxes (a user fee) AND direct transfers from the US treasury! Not to mention the fact that the externalities of highway travel -- pollution, crashes, etc -- are greater in cost than those of train travel. Sat, Apr 7, 2012 : 3:01 p.m.
&quot;One of the great things about high speed trains is they are on a dedicated right of way and aren't as susceptible to the poor decision-making skills of thousands of humans&quot; Incorrect. The crossings are vulnerible to all sorts of issues from the traffic that crosses them. A couple months ago a train struck a truck that was stuck on the tracks. Fortunately, it was a low speed impact. Unlike trains, you can always re-route around highway issues. You're never stuck for hours and hours. The highways are already built. The case for the billions on &quot;high speed&quot; rail is much more difficult to make. Sat, Apr 7, 2012 : 1:56 p.m.
but in a car I can reroute fairly easily. Sat, Apr 7, 2012 : 1:12 a.m. So how much would this be costing us if this was our billion dollar high speed rail system? I don't suppose downtime like this is included in the assumptions of the financial models? One of the great thing about high speed buses is that they can route around problems and aren't stuck to the track. Sat, Apr 7, 2012 : 1:54 p.m.
seems like valid questions to me.